Used around the world – our HENSOTHERM® fire-protection systems for steel are approved by the construction authorities in accordance with the DIN standard of the German Institute for Standardisation and the EN European standard, and have further international certificates in accordance with the Vereinigung Kantonaler Feuerversicherungen VKF for use in Switzerland, British standard BS 476 for use in Europe and the Middle East, Underwriters Laboratories UL 263 for use in the USA and Canada, and Gossudarstwenny Standard GOST for use in the areas belonging to the Russian Federation, for example. Our HENSOTHERM® fire-protection products are intumescent coatings and are thus foaming in case of fire. Fire protection coating systems for steel are available as water- and solvent-based products for indoor and outdoor use on open and hollow, corrosion proofed, and/or galvanized sections. They covert he DIN 4102 fire resistance classes F30 to F90 and the classes R15 to R150 under DIN EN 13501. The foam insulant forms (intumescent) under the action of fire. This foam retards the passage of heat defined for each oft he fire resistance classes. 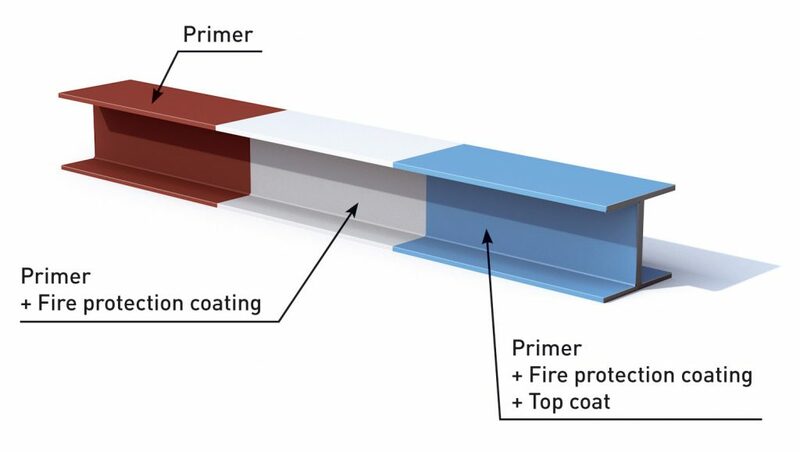 The products for the coating set-up are the primer (corrosion inhibitor), the fire protection coating (foam insulant), and the top coat, which must be applied as specified in the approval. You can obtain further information from the video Intumescent coatings for fire protection.